Whilst searching for butterflies in the Valais region and surrounding areas of South West Switzerland in June and July of 2011 Paul encountered some other interesting mountain wildlife which he captured on film. This short 50 minute film is Pauls personal account of the scenery, flowers, insects, amphibians, birds and mammals he encountered. The story begins at an altitude of approximately 400 metres along the Rhone flood plain and its tributaries. We then ascend through wooded uplands towards the tree line along gushing mountain streams before emerging from the trees into wonderful flower filled alpine meadows. We head up to the snow line passing through lush pastures into craggy uplands at altitudes in excess of 2500 metres. This film includes short clips of the butterflies found in "Searching for butterflies in South West Switzerland" plus other insects and mountain specialties such as the Marmot and Chamois plus Alpine Chough, Alpine Accentor, Snowfinch and Wallcreeper all in fantastic mountain scenery. Please note that some scenery clips are duplicated from "Searching for Butterflies in South West Switzerland". This production was filmed in broadcast quality digital format. The footage has been captured onto a single DVD showing approximately 50 minutes of high quality uncompressed digital video with complete menu accessed using your DVD players remote. Please take a look at the trailer opposite. Please note there is no sound on this trailer but the DVD comes with a full sound track. Hello Paul, sorry for the delay in writing, but we have been busy and have only just had our first viewing of Marmots in The Mist. Another wonderful film, very much enjoyed and as I said previously, without the awful background music so often accompanying wildlife films when all that is needed is the natural sounds. Such wonderful scenery too and so well filmed. Thank you. Hi Paul, Just finished watching "Marmots in the Mist" - fantastic! Yet again you've produced another great film, it flows well and is packed with stunning images backed up with a very informative narration - well done Paul. 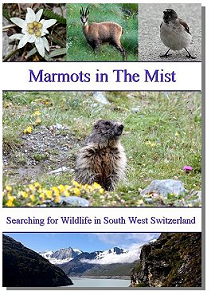 This DVD video "Marmots in The Mist" is available for purchase from £9.50 including postage and packing.